I’ve been really struggling with what to wear since my belly popped at around 14 weeks. The weather going from Sunny to instant Autumn has not helped. It’s hard finding a happy medium and at the same time feeling comfortable. 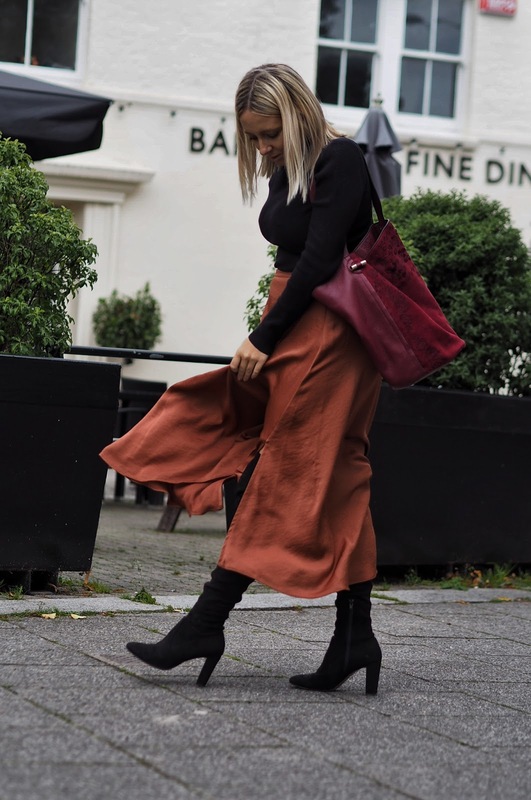 Midi skirts paired with oversized knitwear is one of the biggest trends of our Autumn season. I have seen various versions of this Tan Maxi Skirt during LFW. It isn’t part of a maternity range, I got a size 8 and it fits perfect over my 19-week bump. Not only is this style great for hiding my bump, it is super comfortable. On this instance I opted for a thin knit, that could be tucked into the skirt – either style works. The tip for this is going up a size in the jumper so that it is long and looser, that way it won’t make you look larger. I’ve paired this look with over the knee boots which were perfect for keeping me warm on such a windy day.